Scott Guberman is performing solo, playing and singing one long set of Grateful Dead music. This is a true, psychedelic experience with a repertoire that truly spans the entire catalog of the Grateful Dead, from the most popular to the most obscure including avant-garde, under-performed material. 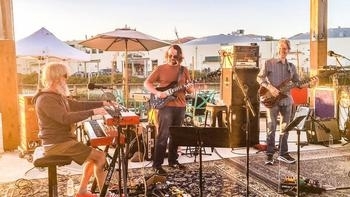 When Scott joins us he will have just a few days earlier played two nights with Phil & Friends at the Terrapin Nation Seder in San Rafael, CA. Scott Guberman began playing piano at the age of 5. During his high school years, he began experimenting with synthesizers and electric pianos. During this time, Scott began playing in rock bands regularly and after high school, he attended The Hartt School of Music where he studied classical piano. Guberman gained recognition amongst The Grateful Dead community in the early 2000's while playing Hammond organ regularly with Rock & Roll Hall of Famer and former Grateful Dead keyboardist, Tom Constanten. During this time, Guberman also toured with Vince Welnick, the Dead's final keyboardist and toured throughout the East Coast with The Vince Welnick Band from 2003-2006. In just over a year the Bahr Gallery, dedicated to sharing the finest vintage rock posters from the late 1960s and 70s, has established itself as a cultural gathering place on Long Island for Deadheads and 60s afficianados in the know. Join us Friday April 26 and find out why.